Ice cream was served in memory of Jenna Kast at the 3rd Annual ‘Jenna's Ice Cream Parlor’. Ice cream was sold for $2 and all the proceeds went to Believe in Miracles. Over 700 ice cream bars were sold to raise $2,750! This enabled Believe in Miracles to help another child and their family, including a 16 year old girl who is battling brain cancer and wishes to go on a shopping spree. Jenna used her fight against brain cancer to bring faith, hope & love to fellow sick children through the Believe in Miracles Organization. New school supplies were collected in memory of customers loved one. The names of individuals in which donations are made will be displayed in the store. The school supplies were donated to the St. Francis Family Center. We collected many pencils, backpacks, crayons, glue sticks, notebooks, and folders. This collection enabled all the school-aged children at the Center, over 100 youth, to go back to school with new backpacks and all mandatory supplies. This was the first time many of the children were able to do that. Moosejaw clothing company donated hundreds of t-shirts for Faith@Work to sell. These shirts were sold for $5 each with the profits going to Mary’s Mantle and The St. Francis Family Center. This sale raised $1,060 for the two organizations. 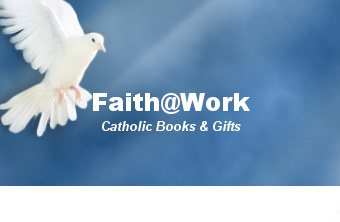 Faith@Work hosted a used book sale to benefit Meghan Salter. Meghan is 8-years old and has been kept alive by a ventilator, a feeding tube, and the grace of God for the past seven years. She is unable to breathe, move, communicate or even sit up on her own. Over $3,000 was raised to help Meghan's family care for her as she grows and her medical needs change. A big Thank You goes out to American Heritage Girls Troop MI0138 for sponsoring the bake sale. And to local authors Nancy Carabio Belanger and Michele Elena Bondi for signing books at the event. We collected over 2,100 school supply items, including pencils, crayons, glue sticks, notebooks and folders! They were donated to the St. Francis Children's center. We collected almost 600 pairs of gently used children’s shoes for Heart and Soles. Heart and Soles is a non-profit whose mission is to take shoes that no longer fit one child and put them on the feet of a child in need. The shoes were donated to orphans and at-risk children in developing nations. St. Anastasia American Heritage Girls Troop MI0138 collected bottles, cans, bottle deposit slips, and loose change for purchase of flowers to beautify Mary's Mantle. They collected $180! 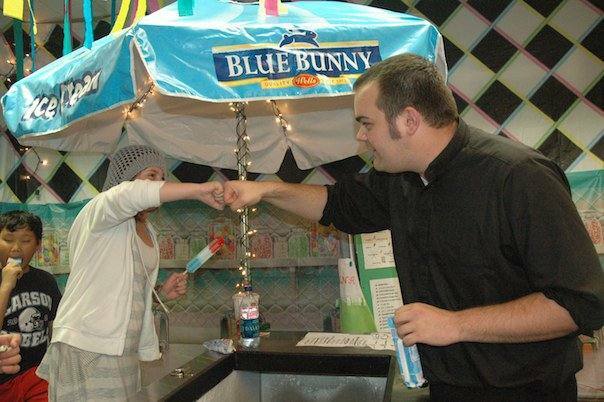 Jenna served over 1,000 people during her ice cream parlor and raised over $5,700 for Believe in Miracles. Jenna has used her fight against brain cancer to bring faith, hope and love to fellow sick children through the Believe in Miracles organization. Over 4,000 stuffed plastic eggs were collected for this year’s Easter Egg Drop. This project was sponsored by many local parishes and schools. Volunteers cover the lawns of 24 local families and 3 shelters with the stuffed eggs the night before Easter. Recipients of the eggs are families that have suffered a loss or experienced a trying period Thank you to all that helped make this possible. 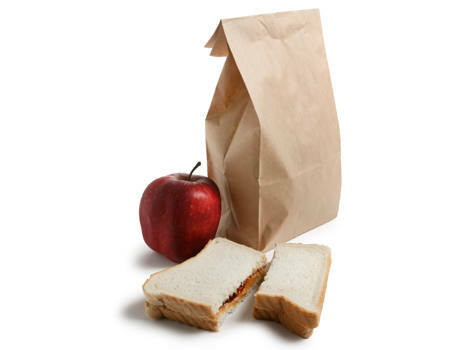 Friends of Faith@Work were asked to pack a lunch similar to what the homeless are given... a peanut butter and jelly sandwich & a piece of fruit for the day. Then, asked to send the $5 they would have spent to St. Aloysius - Canticle Café. This project collected over $800 for their ministry. Their ministry to the homeless was in desperate need of our help as they serve over 300 homeless people a day! We are collected over 100 winter coats of all sizes! The coats were donated to St. Aloysius in Detroit. Faith@Work collected K-mart gift cards for the South Oakland Shelter Christmas banquet. The Gift Cards were given to the parents to Christmas shop for their children. 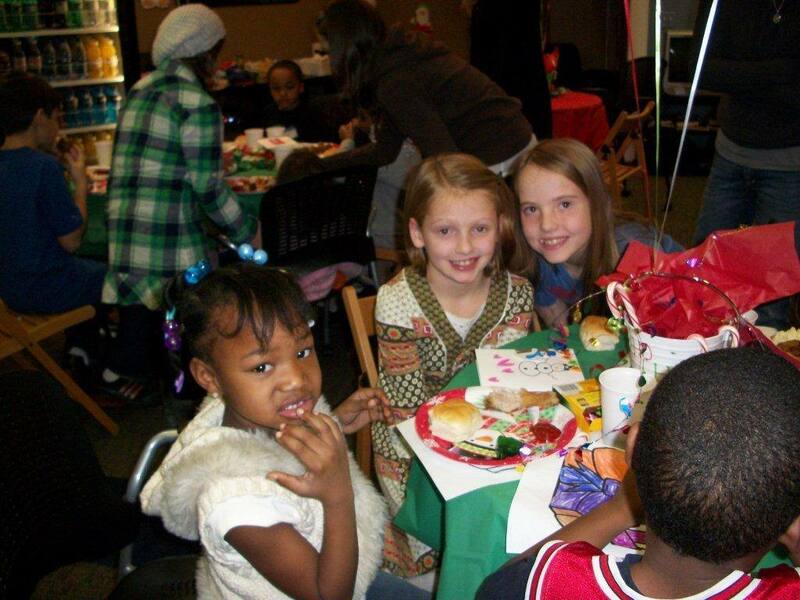 Later in December, Faith@Work hosted a Christmas Banquet for the children of SOS. 15 kids enjoyed an afternoon of games, food, fellowship and a visit from Santa! The American Heritage girls made and collected over 60 shoeboxes for Operation Christmas Child. The boxes were stuffed with small toys and gifts and sent to impoverished children around the world. Over 200 people came by for the afternoon full of fun, food, and fellowship! 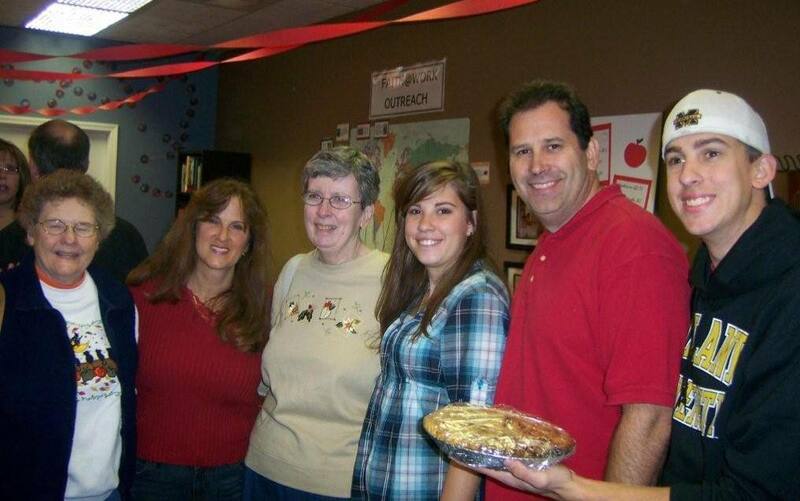 Every last apple pie was sold to raise over $3,000 for the Cystic Fibrosis Foundation. Thank you to all who came and helped to find a cure! Over 700 people attended this event. 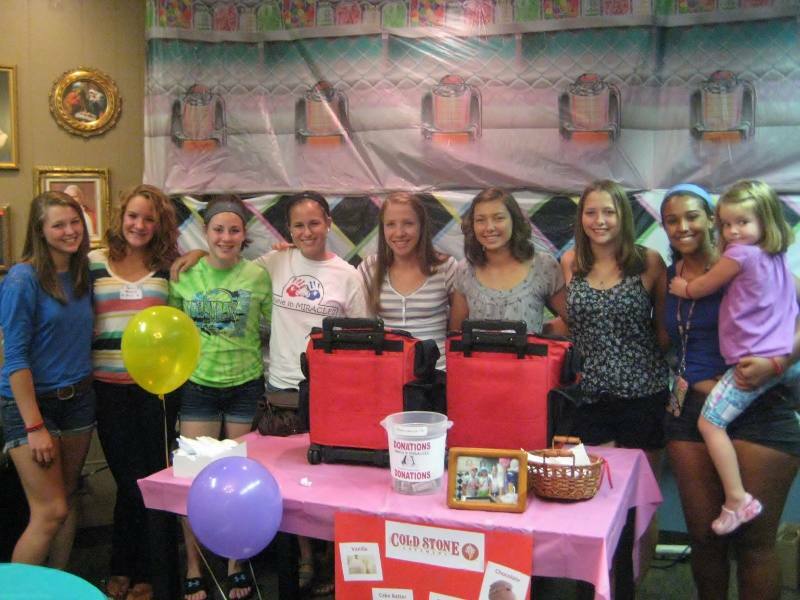 Jenna Kast and her family served over 800 pieces of ice cream and raised over $3,200. Prayer cards were given out to each child. Thank you to the many volunteers that made this day such a success! 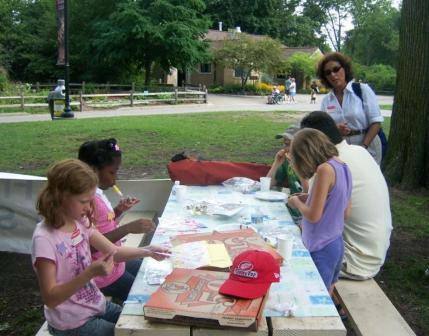 Many of children and adults of St. Francis Center were treated to a day at the Detroit Zoo in August. Faith @ Work was able to raise over $800 in bottle returns money to treat our guests to a fun day at the Zoo with lunch and crafts. Thanks to all that made this possible! Little Dresses for Africa is a nonprofit dressmaking organization that sews dresses from pillowcases for girls that live in impoverished areas in Africa. Faith @ Work made and sent over 200 dresses to Africa and 75 dresses to South America. 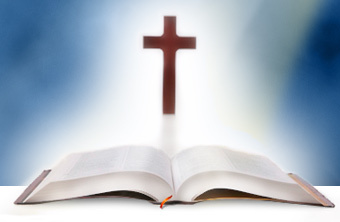 The Faith @ Work community prayed for 83 priests during a 9 day period in May. A total of 72 local families participated in the novena and prayed for the priests at their parish and around the world. 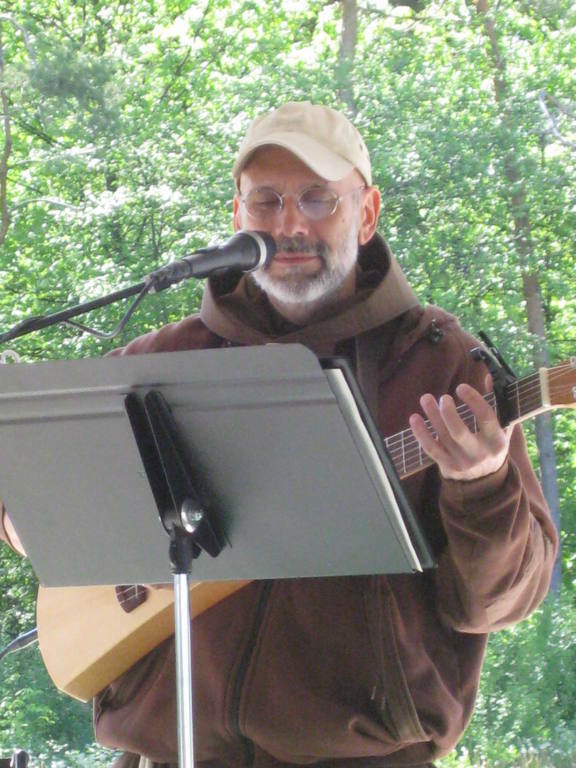 Brother Al Mascia, OFM entertained a crowd of about 150 people at Boulan Park in Troy. Br. Al is a Franciscan who has spent many years ministering to the needs of the homeless. His songs are personal stories reflecting his experiences with these special men and women. The concert raised $650 and collected many canned goods for the Canticle Cafe of St. Aloysius which ministers to the homeless of Detroit. Thanks to all who attended and donated! collected in cooperation with Holy Family School, St. Anastasia and St. Ireneaus. Dozens of volunteers covered the lawns of 26 local families, eggs were also delivered to the South Oakland Shelter and the Capuchin Soup Kitchen. Recipients of the eggs are typically families that have suffered a loss or experienced a trying period during the last year. Thank you to all that helped make this possible. Over 100 baby bottles were distributed and filled with coins to raise funds for Imago Dei Pregnancy Center. This service project was also adopted by a 7th grade class at Holy Name Catholic School. With their help we raised $1,359.40 to aid the Center. A BIG thank you to Moosejaw Corporation for their generous donation of 100's of new sweatshirts, t-shirts and other clothing items. Faith @ Work distributed the clothing to many charities in need including St. Francis Center, St. Aloysius Warming Center, Angels' Place, The South Oakland Shelter and the Capuchin Soup Kitchen. With the help of many volunteers Faith @ Work hosted a banquet for 20 local children that are current residents of South Oakland Shelter. Food, fun, fellowship and a surprise visit from Santa topped the day. Ellen and Mike Salter shared their inspiring stories of faith and hope in raising their daughter Meghan. The message was one that celebrated the gift of each life, inspiring us to embrace our crosses and find the beauty in each day. Shannon Salter ended the evening with a beautiful flute tribute to her sister Meghan. Thanks to the generosity of all who attended, over $1,400 was raised to assist the family with home modifications needed in caring for Meghan. Shoeboxes were collected and stuffed with small toys and gifts to be distributed to impoverished children around the world. Over 50 boxes were collected through Faith @ Work. Faith @ Work teamed up with the VA Medical Center in Kerrville, Texas to assist their residents. Some of their residents were in need of t-shirts, socks and other personal hygiene items. A special thank you to the American Heritage Girls of St. Anastasia and St. Cyril and Methodius who helped with this project. They along with some of the catechism classes of St. Anastasia made beautiful Christmas cards for the vets also. The Nuns are based on Abidjan, Republic of Ivory Coast. One of their missions is to help the youth and school drop-outs by contributing to their social re-insertion. Faith @ Work collected for donation over 100 rosaries and prayer cards that were delivered to this African region. Please save any rosaries or prayer cards that you may receive in the mail..we will make certain they are given to those in need. Three little helpers from St. Anastasia decided to do a fundraiser for Faith @ Work. They raised $35 by selling apple cider and doughnuts. A million thank you's to Grace, Bridget and Catherine for all of their hard work. Thanks to all who attended Brother Al Mascia's concert! Almost $1500 was raised for St. Aloysius Canticle Cafe! What a fun evening filled with great music and fellowship. We collected over $300 in dollar bills and loose change to assist the St. Anastasia Chapter of St. Vincent de Paul. The Society of St. Vincent de Paul is committed to helping qualified families both spiritually and physically- through food donations and monetary assistance with their bills. The number of families seeking assistance is high. In the months of July and August we collected pennies to be used to purchase pencils and other school supplies for the foster care children of St. Francis Family Center. We have collected over $500! We are also collected many boxes of crayons and other school supplies. These are just some of the school supplies that have been purchased with the donations. Volunteer Shirley Black was joined by over 40 helpers who decorated donated flip-flops. These sandals were sent to St. Basil Parish in Columbia, South America, an orphanage in Brazil and St. Francis family center in Southfield, Michigan. Over 300 pairs were collected and decorated! Thank you to all who donated and decorated the flip-flops! Over 275 suitcases/duffle bags have been donated to Catholic Social Services thanks to your generosity. This project is ended, but we will offer it again next year. Below is part of a note sent by Christina Peixoto, Director of Child Welfare St. Francis Family Services Center. I wish you could have seen the expression of Wendy, a 5 year old girl who got her own suitcase (a pretty pink carry on I picked up this Monday); we stuffed the suitcases with clothes, underwear, socks, shoes- we also gave her a backpack with school supplies. I am sure the pain of being away from her family was still there- I hope I'm not wrong, - but the sparkles in her eyes gave me the impression that it reflected hope. Thank you so much for making it happen for Wendy. 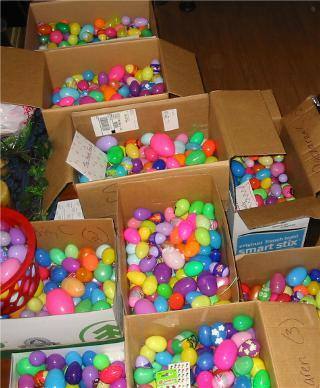 The 5th annual Easter Egg Drive was held and close to 3,000 stuffed plastic eggs were collected. This project was sponsored by St. Anastasia Parishioners and the parents of Wass Elementary School. Volunteers cover the lawns of local families with the stuffed eggs the night before Easter. Recipients of the eggs are families that have suffered a loss or experienced a trying period during the last year.